In this guide we’ll look at the best spotting scopes for bird watching. What Is The Best Spotting Scope? Ultima is a great brand and this is their best scope in my opinion. It’s a zoom spotter with a 100mm aperture for really bright and clear pictures. It’ll zoom up to 66 times magnification without losing brightness and keep its end up in low light levels up to 500 yards away. It’s an angled 45-degree scope with multi-coated optics to keep the lens safe and reduce reflections. There are no chromatic aberration issues here. The Celestron has a quick no-messing about single knob focus, an armored body, waterproofing, nitrogen-filled internals, and it’s matte green to blend into the natural environment. It also has a mount for a camera. I’ve not tried this function, but it looks sturdy enough if you have a good tripod. This is my pick of the bunch and my own personal scope. It’s proved itself time and time again and it’s well worth the seven pounds it weighs for the extra distance and objective lens brightness. This scope takes the hard work out of spotting, it even comes with its own four section tripod for extra stability. This is a zoom scope with 20-60x zoom capability and a 60mm objective lens to let in lots of light. It has fully multi-coated lens for clear light transmission to fight chromatic aberration issues. It has O-ring seals, its nitrogen filled to stop dust and dirt lodging in the internals, and its water-proof up to a meter. This makes it a great choice for spotting water birds or lake work. The 45-degree angled body has one simple focus knob that’s easy to handle as its ergonomically designed. The outer is made from slip and shockproof polycarbonate. Its everything you need a great price! Gosky has produced an adjustable scope with 20-60x magnification and fully multi-coated lens at an affordable price. You’ll see up to 1000 yards with this scope, and because the lenses are top quality there no chromatic aberration problems. It gives bright, clear images every time. This is a tough and durable scope with non-slip grip and shockproof coating. It’s an angled scope on 45 degrees for comfortable viewing, and has an extendable eyepiece shield to keep rain and sun out which is a nice touch. Waterproof, O-ring sealed and nitrogen filled it keeps out water, moisture, fog, debris, and dust too. This scope can also incorporate your smartphone so you can take pictures and record your spots. Equipped with its own tripod and carry case reviewers like this scope for its high-quality optics and bargain price. This scope offers a bright and crisp view through a multicoated lens that deals with any chromatic issues. The dynamic lens system has an easy-to-focus single knob that saves precious time in cold weather. The variable zoom spots from 20 to 60 times magnification and reviewers say they’ve had some awesome spots at 1000 yards. Its waterproof, nitrogen-filled, and completely sealed against the weather with rubber armored coating. You can attach your smartphone to take pictures with its cell-phone adaptor and it’s built on a 45-degree angle for comfortable viewing. Extras include a carrying case, further straps and its very own sturdy tripod with a stable base. This spotting scope is a great buy that is easy-to-use and offers great value for money. This spotting scope is a highly affordable option with zoomed 15 to 45x adjustable magnification and a 60mm objective lens that’s broadband anti-reflective coated. This scope has an angled neck at 45 degrees for easy watching and a twist up sunshade to prevent glare. Importantly, it’s O-ring sealed and nitrogen purged to keep out moisture and debris, plus its properly waterproof. I’m struggling to find anything wrong with this scope given its low price. Although it doesn’t magnify as much as pricier scopes, it delivers a crystal clear bright image due to its 60mm objective lens. If you have to choose between more magnification or more light through the objective lens– go with the light every time. A straight barrelled scope you can whip out in your car and use without a tripod for a short period because it only weighs 2.86 lbs. This is an adjustable zoom scope with 20-60x magnification and 60mm objective lens. It has multi-coated optics to enhance light transmission and provides a crisp, clear image. Its waterproof, fog proof, and comes with its own compact tripod, though you might want to upgrade this if you’re a serious spotter. It is a little flimsy. Unlike others, this scope comes with a soft carry case and a hard carry case. A hard carry case is something extra you’ll need to protect against accidents, so having one included is a great bonus. This low-priced scope provides serious clarity and it’s easy to focus in a rush with the single-barrelled knob. Armor coated, anti-slip, and dark green for camouflage, this is top buy that some reviewers have been using for years. This scope has a large 70mm objective lens and an adjustable 25-75 variable zoom which is plenty to spot birds at distance. The lenses are multi-coated and it comes with its own tripod. Some reviewers say it’s a little flimsy, but if you treat it gently it works well. This good value scope is nitrogen-filled and O-ring sealed against dust and debris. 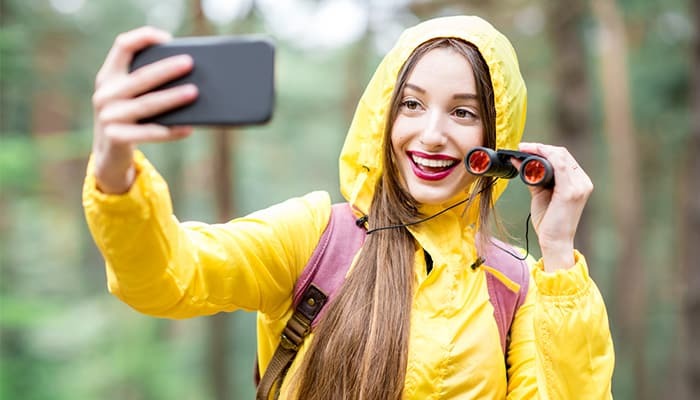 Its waterproof to an extent as it will deal with raindrops but not a rainstorm. You can attach your mobile phone to the mobile device mount and take pictures of your targets – the dynamic lens focusing system makes it easy. It also has an extendable sunshield to reduce glare and protect the objective lens. All in all, this is a good little scope at a bargain price. A spotting scope is a telescope designed for viewing objects on earth rather than space. 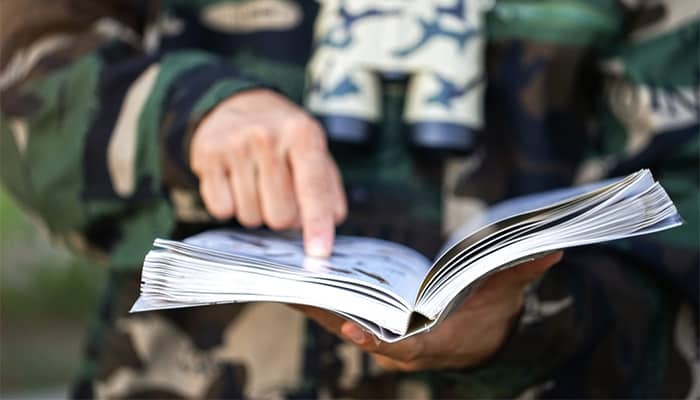 They are more powerful than binoculars, and if you’re an avid birder that wants to spend some time focusing on wader birds across the lake, or high-flying cliff top birds, they bridge the range gap. What’s the point of a spotting scope you ask? Well, perhaps you’ve used binoculars and found you need more magnification? That’s where a scope comes in. Scopes are for distant bird watching and really help you to identify birds and observe their natural movements. Say you’ve located a nest and want to take a good look – a scope can give you all the view you need without disturbing your feathery friend. Lots of people ask if you need a tripod with a scope. I say, yes you do. To get all the benefits a scope offers it needs to sit on a tripod. When you discover arm-free spotting you’ll be hooked. The steady, clear image achieved without arm-ache makes the hobby all the more enjoyable. Not to mention you can pour your thermos without taking your eye off the prize. Generally speaking, the more you spend on a scope the better the view. That’s because the technology that creates a clear picture is expensive – HD glass for instance and fluid focusing ability all mount up, however, there are definite bargains to be had and just because something is expensive it doesn’t mean it can outperform a cheaper scope. I wouldn’t recommend spending below $100 if you can help it. Keep your cash and save up for the fully multi-coated lens and high-quality glass. When you’re setting a budget don’t forget to incorporate the cost of a tripod. These aren’t expensive items but it all adds up. Once you’ve chosen your scope it’s time to set it up. Exciting times! First, extend the tripod legs and place them on a flat, sturdy surface. Uneven surfaces are asking for trouble as the scope is in danger of smashing, and you’ll develop eye strain or motion sickness from the almost imperceptible wobbles. Next, attach the tripod plate to the spotting scope. This is the gizmo that joins the two pieces of equipment together. Clip the scope into place. Listen for the click and give it a gentle wobble to make sure its firmly in place. Remove the lens cap and eyepiece covers – sounds simple but it’s easy to forget. Even after years of birdwatching, I forget on a regular basis. In the early days I’d have a good rant and utter a few choice words, but now I just shake my head at my advancing years. Put your eye to the viewer. Start at the lowest magnification and scan the horizon or a distant tree near to where you suspect the birds are. Roll the magnification knob until the image is clear. That’s your practice set up. When you spot a bird increase magnification and focus. Once your target is firmly focused tighten the tripod head so it doesn’t swing around. Where switches and locks are will vary depending on your scope and tripod, so it’s best to find these areas at home in the warm and dry before you venture outside. Fair warning – it can be annoying and frustrating to begin with especially focusing. There is nothing wrong with you or the scope! Practice patience and little movements. You will get there. Numbers on a scope refer to two measurements. These are the magnification range and the objective lens size. Scopes vary between 15x and 250x magnification. This number shows you how many times closer your bird will appear. For example 15 x 60 is a 15 power magnification scope, meaning birds will appear 15 times their size. If you’re looking at a zoom scope the numbers may say something like 15-25 x 60. This means the zoom ranges between 15 and 25 magnification. Let’s take the above example again. 15-25 x 60. The 60 refers to the size of the objective lens, which is the front lens, in millimeters. The bigger it is the more light gets through and the brighter an image becomes, but larger scopes are heavier and more cumbersome. If you’re regularly birding in low light levels, you’ll need a big objective lens to gather as much light as possible – maybe even 100x. Daylight birders will do well with 50-80x. It’s a trade-off between what you’re willing to carry and how badly you want close up views. Lens diameter refers to the objective lens which we’ve looked at above. It’s often referred to as the aperture as well. Fixed versus zoom That is the question! Some scopes have one eyepiece that’s attached and doesn’t swap out. They are simple to use and cause you very little hassle. Other scopes have interchangeable eyepieces of fixed magnification. Instead of zooming in and out you change the eyepieces. They are annoying in cold weather when your hands are frozen stiff, but they do give a steady view. Zoom eyepieces are more expensive but they are better for birding, I’m not going to lie. In the past, zoom lenses had a bad reputation because they didn’t let in much light and images appeared dark. Cheap zoom lenses still have this issue, but good quality zooms have overcome the problem. Buy good quality and you’re safe. Not to confuse you, but there are wide-angled eyepieces too. 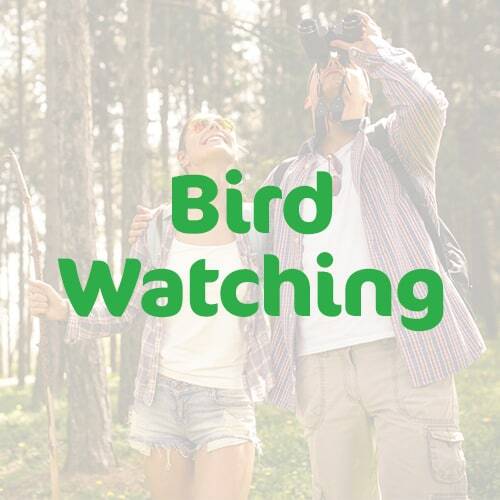 These give you a broader range of view, and if your bird is a fast-mover, it means you stand a better chance of spotting them. I can’t overemphasise the importance of good quality glass. It makes a massive difference to what you’re able to spot. This is because even though it’s see-through, glass blocks light, and cheap, blurry glass blocks lots of light. It’s a problem because clear images rely on lots of good light. Without it your image is dark, and frankly, bird-spotting is pointless when the images are dull. Lens coatings make the difference. Coatings transmit more light through glass prisms and lens which means your bird appear brighter and clearer. Always look for a scope with coated lens, preferably multi-coated lenses which are more expensive, but are the best for light transmission. Cheap poor-quality lens can also create what’s known as chromatic aberrations. This means light passes through at different wavelengths and creates an unfocused, dark image. You may see a ring of color around your bird if this is happening. But all this lens technology adds to the bill. If you’re looking to spend a set amount, go for better quality glass over higher magnification. A slightly smaller crisp image is so much more satisfying than a close-up blurry image with a rainbow fringe. We’ve talked about straight versus angled barrels in the binoculars review, and it’s much the same with scopes. You can choose between a straight viewing scope where the barrel and eyepiece are aligned, or an angled scope that offsets the light path with a prism by up to 90 degrees. It makes very little difference to the quality of your image. Straight scopes are easier to use, but angled ones are more comfortable on your neck as you look down. You can’t go birding unless you can focus that scope, so practice and practice some more. Before you buy, check focusing distances on the manufacturer’s blurb. Ideally, you should be able to focus down to 20 feet minimum. Now for the specifics: There are three different types of focusing mechanism. Single-knob mechanism is the most common. It’s simple and slow but precise. Purists prefer the single knob and say the other types are just gimmicks. You can make up your own mind and argue it out on an internet forum! Single knob focusing is one small barrel that turns to focus your image. Simple stuff. Double-knob mechanisms have two drive ratios. One is for quick focusing if you spot something that looks ready to fly, the other is a slow and precise focus knob that gives a better than real life view. A helical mechanism is a focusing ring generally used on top-quality $1000 scopes. Instead of a knob, you have a collar, a type of ring that you spin to focus. There’s no best way to focus, it’s all down to preference. Important stuff that can get forgotten. Lens caps are essential otherwise that fine expensive glass you’ve just purchased will get scratched, covered in crumbs, and filled with dust. Horror! These things are not easily reparable. Look for firmly attached lens caps that don’t fall off, and when you aren’t looking, cover them up. Spots of rain obscure the view, you rub it with a gritty glove, and that’s your lens destroyed. Cases protect against damage as well as lens caps. Padded cases absorb bumps should the scope fall over in the boot of your car or slip from your hand. Waterproof cases are a really great buy, especially if you’re spotting outside a shelter. There’s no end of birders on eBay trying to buy replacement lens caps. They are far too easy to lose. When you take one off put it in the same place each time –a trouser pocket is my go-to. Rain, fog, and humidity all wreck scopes. Look for a scope that’s nitrogen filled as this keeps the internal mechanisms dry and rust-free. The outer casing of the scope must be weatherproofed or it won’t last long. If you can get a scope with rubber coating, don’t hesitate. Rubber coatings not only keep out wetness they offer some protection against slippery cold hands letting go of the precious scope. Or worse, someone else dropping it. Deep breathing techniques are another essential if you’re birding with others. 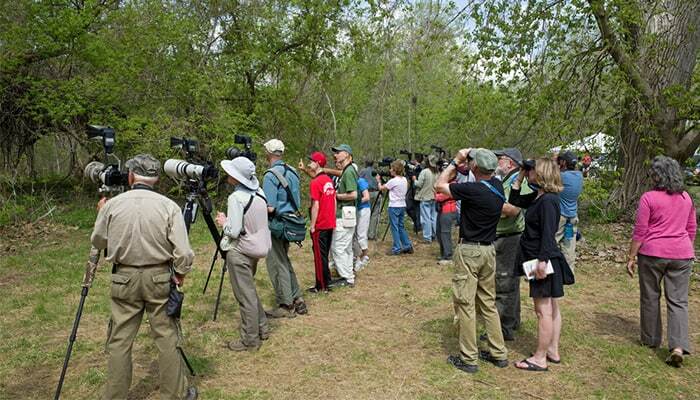 We’ve spoken a little about tripods already, but tripods are an integral part of scoping out birds. Scopes get heavy after an hour because they need to be held one hand in front of the other rather than side-by-side like binoculars. They are essential pieces of birding equipment. Don’t cheap out. The tripod should be raised high enough for your viewing comfort, so if you’re tall, look for an extra high tripod. Feet should splay out wide enough to provide steady support and it needs non-slip feet. A tripod doesn’t need to be heavy because scopes aren’t lead weights, it’s the extended viewing sessions that make them feel heavy, so choose something you can comfortably carry around. So that’s scopes in a nutshell for you. I hope I’ve been of some help. My golden rule is to choose the best quality coated glass you can afford. If this means dropping down on magnification, so be it. Learning to use your scope will pay off. A $1000 scope is useless if you can’t focus it. Spending around $150 will get something decent, but spending the time to understand its capabilities is where the money’s at.